Hello and welcome. 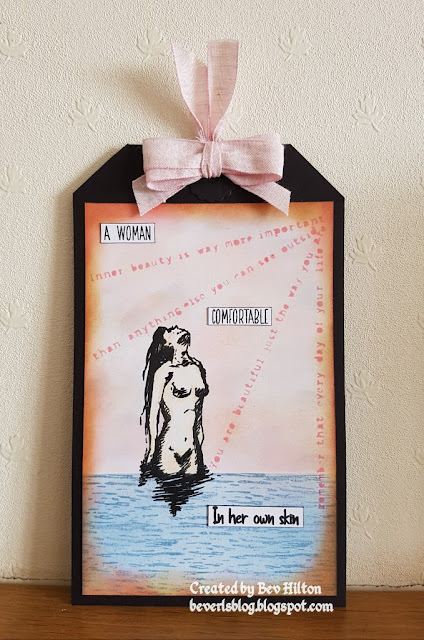 I just could not wait to play with this awesome stamp from Lavinia. Isn't it just amazing. The possibilities are endless. This piece didn't quite go to plan but I kept going anyway. A little too rushed but the end result was okay. Visible Image... Live in the moment. That's Crafty... Inspirational Quotes - Set 1. Clarity Stamp Stencil... Double Sprig. Tim Holtz distress inks... Dusky Concord, Seedless Preserves, Twisted Citron, Peeled Paint and Mustard Seed. Ranger Enamel Accents... Electric Lime. Imagination Crafts Sparkle Medium... Gold Shine. Imagination Crafts...Starlights Metallic Paint... Diamond. I began with a large piece of smooth white card. I reverse stamped the eye using versafine as this not only gives a crisp image but stays wet long enough to reverse stamp the image exactly where you want it. It's best to stamp the reverse image first as it will be much easier to line up the second eye. Stamp the dragonfly facing down using the same ink. Now stamp all the images again onto making paper and cut out carefully. You only need the actual eye part and eyebrow of Simmi and the wings of the dragonfly. Place these carefully over the images. Now for the blending. This didn't go exactly to plan and my colours should have been brighter and more defined but as time isn't kind to me these days and rushing, it kind of got spoilt but I refused to bin it and carried on anyway. I used all the colours listed above and blended using brushes. I then took the Splash stencil and a baby wipe to take some of the colour back off around the edges and brushed back over with the Mustard Seed. 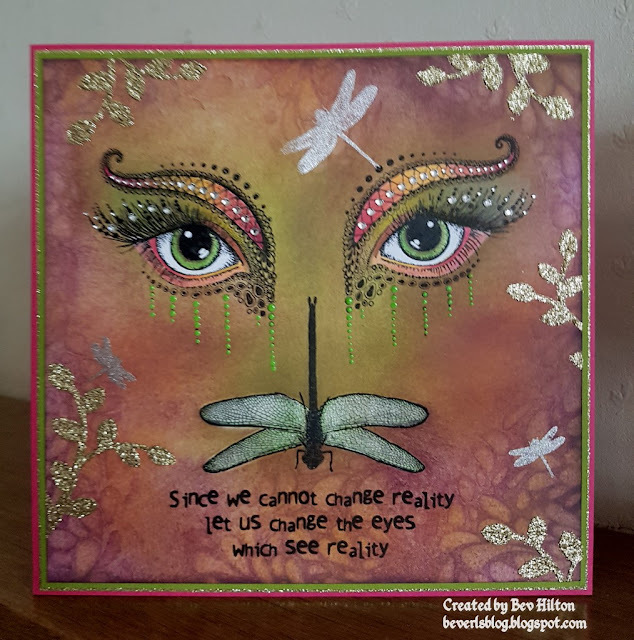 I wanted a little sparkle so took the smaller dragonflies from the set and dabbed it with the Starlights Metallic Paint and stamped them onto the card. Now remove the masking and colour the eyes and large Dragonfly wings with the pencils. I used the black Posca pen to sharpen the outer eye and a few lashes. Once happy add the bling. Take the verse from the quotes set and stamp at the bottom with versafine ink. More bling needed I felt so took the Sparkle medium and pushed it through the Double Sprig stencil at random around the edge of the card. Take the Enamel Accents and carefully dot down from the eyes covering the black dots already stamped from the image. Brush over the large dragonfly wings with the Wink of Stella. Now mount onto the gold card leaving just a tiny border showing and then onto a complimentary colour card. I chose the pink to pick up the pink on the eyes. I hope you like it. I have to say I'm loving Simmi. 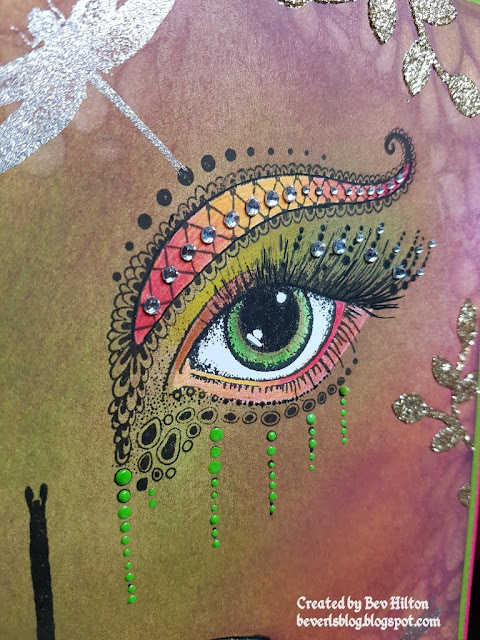 It is in my opinion by far the best eye stamp so far and so many ways you can bling it up. I just hope I can find some more time soon to have another play but I think my next make will be with the Lavinia Seahorse because that in my opinion is the best seahorse stamp so far.... smiles. All from me for now. Enjoy the rest of your week and happy crafting. Stunning!! I have this stamp on oreder and can't wait to try it out.